There’s been no mileage in the last 2 weeks in the 4AGE Midget but there has been another little tweak. 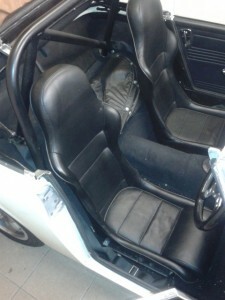 The heavy Lotus Elise seats have been removed and replaced with lighter Intatrim Ranger seats. Mind you, most of the 5Kg a pair weight saving came from the frames to mount the Elise seats to the runners. With the Rangers they just needed simple pieces of flat bar between the runners to mount onto. Currently they’re mounted with the base parallel to the floor but I might raise the fronts slightly to improve the seating. They’re yet to be proven on the road (snow is stopping play today) but they do look an improvement over the Elise seats. There is even space down the sides of the seats for some pockets to put junk in. The winter weather has kept the Midget in the shed for a while so I thought I’d look at fitting the (allegedly) Frontline front suspension units. Initially the fixing bolts didn’t align but after a week of re-drilling holes, fabricating the lower arm mounts, fitting new 340lb springs and rerouting the brake lines I ended up removing them. They didn’t offer and negative camber gain and the callipers were so close to the dampers on full lock that it looked close to a MOT failure. With just the 340lb springs fitted (purchased at the NEC from Rimmer Bros) it was time for a blast and the improvement over the stock worn springs was vast. The whole car felt more stable on the lumpy Norfolk roads but there is one thing that needs changing – the headlights appear to point skywards now that there is less sag at the front. Withe the weather staying cold it was an opportunity to do an oil change but this was an oil change by removing the sump. I was surprised at the amount of debris that was left in the sump after draining the oil. A few pieces of very long human hair, some paper tissues and various bits of what I assume are hardened carbon deposits in semi circular shapes. A good clean out, then checking the conrod bolts and it was all bolted back together and new filter and oil fitted. A quick trip to the garage to fill up the tank revealed a MPG figure that is worse than either of the Porsches – just 19.7MPG from a 1587cc engine. OK, there have been a lot of cold starts but the fuel map has been leaned out a lot so I was hoping for 30+ despite the enthusiastic driving.